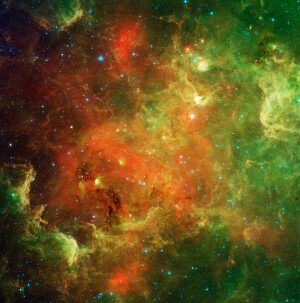 People often ask if stars are up there, beyond our blue sky, during the day. The answer is surely yes, because Earth is a planet in space, surrounded on all sides by stars. Here is a view looking southeast at morning in late February or early March. Of course you really cannot see the stars, but they are there. The constellation behind the sun around now is Aquarius the Water Bearer. 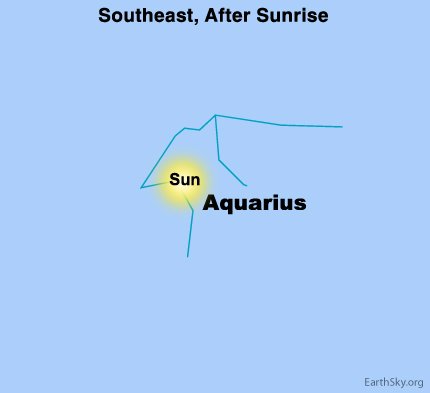 Every year, the sun passes in front of Aquarius from about February 16 to March 12. The stars cannot be seen because of the glare of the sun. However, sometimes when there is a total solar eclipse and the sun’s light is blocked, stars can be seen in the daytime sky. When is the next total solar eclipse in the U.S.? There are other constellations up during the day today. They are the same ones, in the same relationship to each other, that you will see at evening six months from now … when Earth has moved halfway around in its orbit of the sun … and our night sky, not our daytime sky, is pointing out on this region of the galaxy. Site contents copyright © 2019 Recorder Online	except as noted. All rights reserved. | 83 queries in 1.282 seconds.